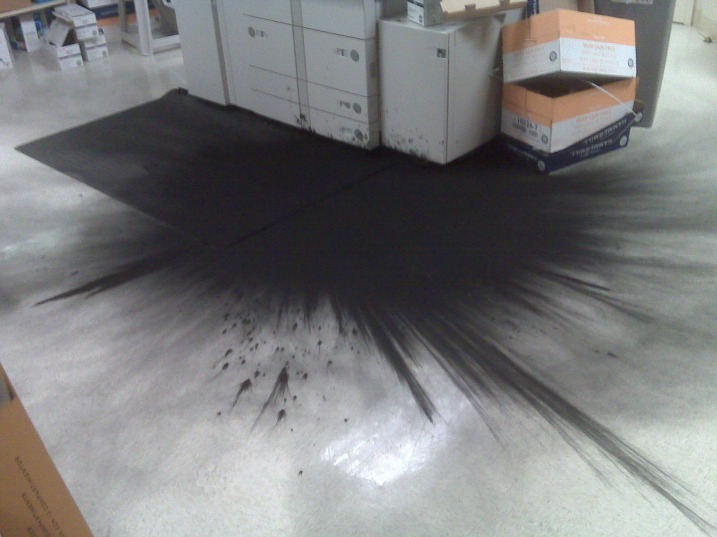 Maybe you were only swapping waste toner bottles or installing a new toner cartridge and shook it just a bit too hard. All you know is, you have a massive mess on your hands— and on your shirt, your shoes, the copier and the floor. As daunting as it may look, if you get after it right away — in the right way — it’ll be like nothing ever happened at all. But first, before you do anything, remember that heat is not your friend when in comes to toner, unless of course you are printing something. It’s heat that fuses toner to paper and it’s heat that will fuse toner to your skin, clothing or whatever. In other words, while you may think warm or hot water will do the trick, don’t do it. Always use cold water! Secondly, toner is made of extremely fine plastic particles and is therefore easily dispersed in the air and strongly affected by static electricity. For these reasons, never use a standard vacuum cleaner to clean it up. If you do, well, let's just say if you thought you had a mess before, you will surely will have one now — and even risk a fire. You’ll find copier service techs equipped with an ESD(Electrostatic Discharge-safe) toner vacuum with a HEPA filter and electrically conductive hose. If you don't have one of these gadgets, please call your copier tech who does. Protect yourself. Toner is an extremely fine powder and you don’t want to breathe it and get it all over your skin. So before tackling the cleanup project, be sure to put on a paper facemask and some disposable gloves. If you have a large amount of loose toner, scoop it up, place it in a bag and seal it. You can throw it in the trash, but you might need to check your local regulations to see if such material is prohibited and dispose of it accordingly. Grab a paper towel, wet it with cool water and wipe down the surfaces at the spill site. If you got any toner on clothing or other fabric, while still wearing the facemask, take the item outside over a trashcan and shake the item out. If any toner remains, you can toss the item in a clothes washer, but make sure to only run the machine on cold, otherwise the toner will melt and adhere to and stain the item. Also, do not iron or dry the item in the dryer without being absolutely sure all the toner is out, or else that design in your shirt will be permanent. If you find toner on the carpet, dampen a clean towel with dry cleaning fluid and dab up the toner with that. Don't use water. If you use water, you are liable to stain the carpet. Otherwise, use a toner vacuum. Any remaining toner on the floor or other surface you can vacuum up with a toner vacuum cleaner. Again, as toner is very fine, it’s important to use this vacuum as its filters can pick-up toner without dispersing the fine powder through the air. Check to see if your copier has a cleaning cycle. If yes, start it and that should remove any loose powder in the piece of equipment. Also, you can run ten or 20 copies and that should clean it up. If you find quite a large amount of toner inside the machine, you might want to contact your technology service provider for a technician to do the work so as to avoid injury to yourself or the machine. And just for a final note, if your business has quite a few machines and goes through a bit of toner, thus increasing the chances for a toner mishap, you might want to talk with your office technology dealer to see if they will lend you an ESD-safe toner vacuum. R.K. Black, Inc. is an Oklahoma City-based leading provider of office technology solutions to small and medium-sized businesses in and around central Oklahoma. We specialize in everything business technology from copier, fax, printer and scanner technology to document management, onsite paper shredding services, VoIP phone systems and managed IT support to video surveillance solutions.